The Halifax Waterfront will host the ROUTE Halifax Saint-Pierre race, a prestigious international 350-mile Ocean Race running from Halifax, NS, Canada to Saint-Pierre et Miquelon, France.The Race happens Bi-annually, in the off year for the Marblehead to Halifax Race. This year the race departs at Noon on June 26. Boats will be along the waterfront beginning today. In the past, the Race has begun off the RNSYS in the Northwest Arm. This years race will include a group of 25 international sailboats and their 200-person crew. 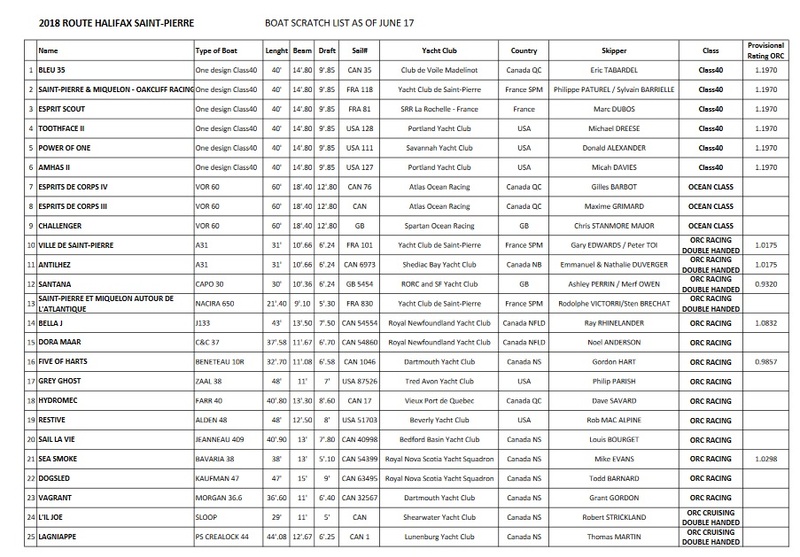 The boats are coming to Halifax from both sides of the Atlantic, including 14 Canadian boats (7 NS, 1 NB, 2 NFLD, 4QC), 4 French boats (3 Saint-Pierre et Miquelon, 1 France Mainland), 2 English boats and 5 American boats. The boats will be moored between Bishop’s Landing to the Summit Seawall (just north of the Stubborn Goat Beer Garden). Also in attendance will be the French Marine National ship Fulmar, which patrols the water of Saint-Pierre et Miquelon, and put into Halifax today. Hailing from Saint-Pierre et Miquelon, Blague et Hale (French saying meaning “Talk but work”) have been performing their original upbeat pop and rock songs along with French and English covers for the past decade. They have performed throughout Saint-Pierre et Miquelon, Newfoundland, and as far as Paris. Chanson d’Occasion is a familiar name to many who live in France. These three musicians cover French hits from the past while bringing them to new life with a gipsy/swing twist. Let Chanson d’Occasion’s show take you back to the 80s with its signature blend of flashy colours, vintage video game vibes that blend the kitsch with the classy. Known for her powerful voice and captivating stage presence, Izabelle’s career took off in 2012 when she was noticed by star music producer Henry Hirsch (Madonna, Michael Jackson, Pink). Since then, she has been a regular name on the iTunes’ Top 10 list and has had the opportunity to perform alongside stars such as Serena Ryder, Deadmau5, and Randy Bachman. Izabelle in concert is not a performance to be missed. This entry was posted in sailing, yacht on June 22, 2018 by Peter.